FORT MYERS, Fla. — Yulonda Wilson clung to a glass picture frame of her only child, Theodore Bell III, as she approached the podium to speak about her son's murder. Citing a young boy and girl at her side, "when I tell you that we as parents have a hard time... they have a harder time. Every single day, they have a hard time," Wilson said. Wilson's son was shot and killed in a car on August 6, 2017. Wilson was one of several who took to the podium to speak on behalf of their deceased loved ones. Chevala Jones, a crime victim advocate for the Fort Myers Police Department, says the commemoration was for everyone. “It doesn’t matter if you’re a victim of a homicide, a victim of a battery or child abuse, everyone is invited to attend,” she said. After the speeches, Jones passed around little envelopes with a butterfly inside. 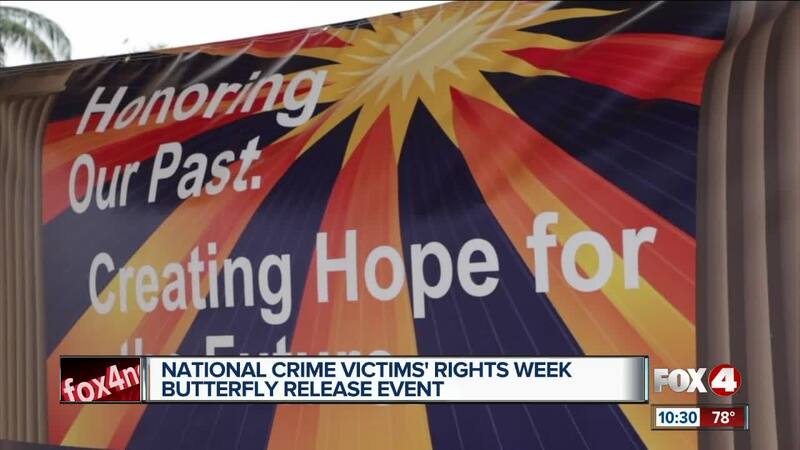 “Butterflies symbolize the release of a person’s growth from a crime that they’ve experienced, the tragedy, and moving forward from it," Jones said. For more information on victim's rights, click here .